If you want a map, chances are you'll find what you're looking for at the Hagstrom store at 51 West 43rd Street in midtown Manhattan. But in a sign of the times, the store is closing its doors on Saturday evening, after spending a quarter-century at the location. "Unfortunately, the electronic world is putting an evil crunch on the map business", John Muchnicki, President of Langenscheidt Publishing U.S., the company that owns Hagstrom, told NBCNewYork. Regular customer Bob Tozzo of Valley Stream echoed the sentiment of other store browsers: "It's really sad. I'm here all the time looking at maps. It's unfortunate." Muchnicki explained that Langenscheidt is "selling off the entire map and atlas business." He points out their other store in Washington DC will also probably close its doors soon. The Manhattan store sells maps from"across the entire world, from almost every publisher that does a map. From the smallest mapmaker in Texas to the largest map maker, Michelin." But times have changed now that global positioning satellites can help you find your way, as well as mobile devices and apps. Doug MacConnell of Avon, Connecticut told us he prefers using a GPS over a map because "it's easy. I don't like wrestling with maps." And Antonio Njango of Bloomfield, New Jersey agreed, saying that "with a regular map, you have a whole big thing which you have to hold in front of you. With a digital map, you have it right here. It's convenient. It's on the go." Back at the Hagstrom store, shoppers argued the merits of maps versus GPS. Jorge Ramirez, a native of Cuba who now lives in Manhattan, said, "we use a variety of things. But there is something to be said about the physical map. You can see where you are now, where you can be. And you have far more control and perspective." For manager Mahmudul Azim, the store closure means much more. He's been working at Hagstrom for seventeen years, and described feeling "really sad." When asked what happens next, he said "I don't know yet", and acknowledged he'll have to find a new job. Employees are already filling up boxes with unsold maps. Some of them will go to the company's other store in Washington DC, but Muchnicki already warned "that store will probably be going as well." 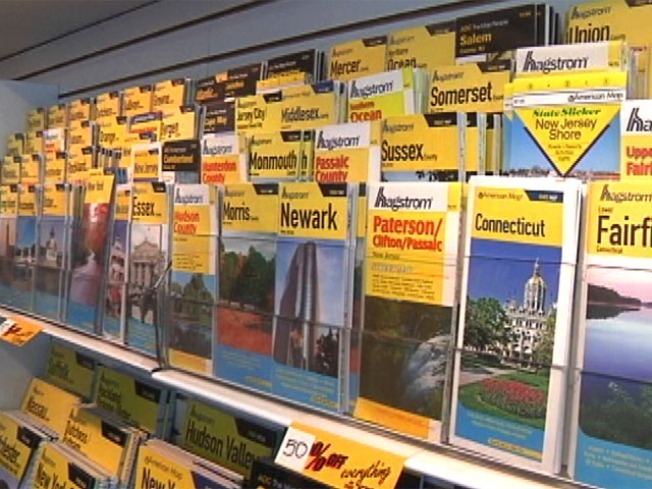 He admitted that while consumers can find maps for sale at places like Barnes and Noble and Borders, he added "you won't find the selection that you have here. So online is really your best option." The Hagstrom store -- which is/was located between Fifth and Sixth Avenues -- opens for the last time at 10:30am on Saturday, July 17th. Manager Azim says he will keep the doors open as long as customers are there, before shutting the store forever.